There are three ways to enter the merchant marines. One is to go to a maritime college. Another—increasingly rare—is to “come up through the hawsepipe,” by climbing aboard a vessel with little more than a Merchant Mariner’s Credential (MMC), a Transportation Worker’s identification Card (TWIC) and a work ethic. Or, you can get formal maritime training at a dedicated maritime school. The Chesapeake is blessed with a range of maritime schools with training options for mariners of all stripes. And, because these schools are focused on turning out employable mariners, most also have close links to employers. “We have relationships with people at Norfolk Tug, McAllister [Towing and Transportation], Great Lakes Dredge and Dock, Marathon Petroleum in the Western Rivers,” notes Caroline Smith, coordinator at Mariner Boot Camp, an adjunct of the Mid-Atlantic Maritime Academy (MAMA). MAMA, which absorbed the Tidewater School of Navigation in 2006, trains approximately 3,000 mariners annually. Courses run the gamut from the Boot Camp, designed for total novices, to longtime professionals updating or upgrading credentials and licenses. Mariner Boot Camp, begun in 2016, has so far trained 104 students, 28 of whom are women. “We have two graduates with NOAA, some on cruise ships, and a whole bunch on the [cruise ship] Pride of America in Hawaii,” says Smith, who holds a 1600 Ton Ocean Master Motor, Steam, and Sail License. Founded in 1972 in Baltimore by the International Organization of Master Mates and Pilots, non-profit MITAGS boasts a large campus near BWI and offers about 100 courses that range from entry-level for ordinary seamen (and women) through upgrading for licensed mariners to professional development, including courses designed for individual companies. CTMI instructor Captain Alan Alexander demonstrating the importance of maintaining morale in difficult situations at sea. Located on St Mary’s River, The Paul Hall Center was established in 1967 as The Harry Lundeberg School of Seamanship by the Seafarer’s International Union (SIU). It requires membership in the union, but the training, room, and board are free. In addition to classwork, training includes hands-on work at the center. “You’re also working in the galley feeding the rest of the union people who are here,” says Abernathy, who recently took a three-week welding class there. Graduates find employment through the SIU union halls. 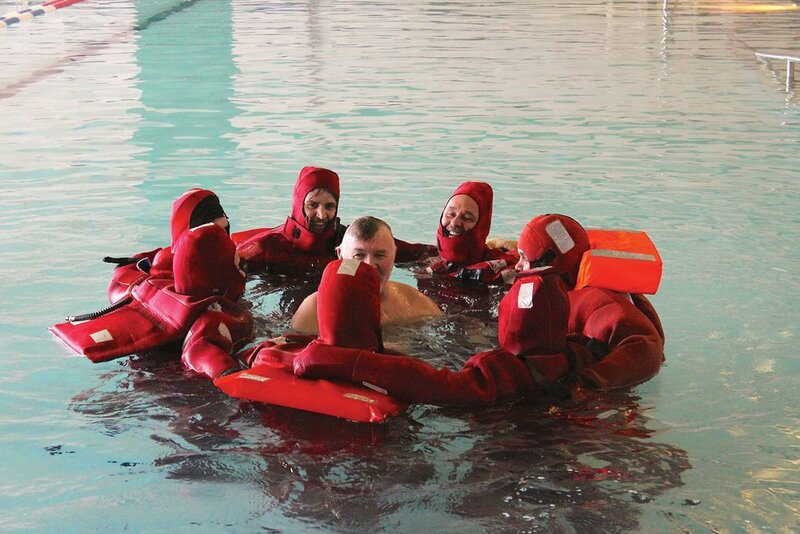 The Mid-Atlantic Maritime Academy, in Norfolk, prepares students for careers on the water. Some, but not all, of the mariner schools have on-campus accommodations. MITAGS and its West Coast affiliate, Pacific Maritime Institute (PMI) in Seattle, have on-campus hotels and other amenities to keep an oft-absent mariner’s family entertained while he or she takes classes. Students at MAMA and CMTI stay in nearby hotels if they don’t live close enough to commute. “We have several local hotels in the area that we’ve contracted with for a deal for students,” says Symonds. In Eastport, the Annapolis School of Seamanship (CBM’s sister company) began in 2002 by offering courses in basic boating. “We started out with a diesel engine course for recreational boaters,” says John Martino, founder and president of the school. “That moved into electrical classes, marine weather and navigation.” The school now also trains students for the Operator of Uninspected Passenger Vessels (aka “six-pack” license), the 100-Ton Master Mariner’s Captain’s License, and the 200-ton Master’s upgrade. The school has expanded its offerings and its range. “We also do B2B training solutions for other companies and do military and law enforcement seamanship training,” Martino adds. The merchant marine is not everyone’s cup of grog. It’s a physically and mentally challenging career. It often demands weeks or months away from home. It can strain relationships, though it can help keep the spark in a marriage with each return home a kind of honeymoon once the yelling about who’s in charge is finished. But the skills, the sense of pride and the connection to a millenniums-old tradition can help to compensate for some of the sacrifice that mariners and their loved ones make. Nancy Taylor Robson, author of Woman in The Wheelhouse, worked for six years on coastal tugs as a deckhand then earned her operator’s license in 1981. She has been married a long time to a longtime mariner. is a federal college. The education is free. In exchange, graduates are required to fulfill a period of military service on graduation. Several states have maritime colleges such as the State University of New York Maritime College (SUNY Maritime), which are maritime-focused. They require tuition but do not commit graduates to a period of service.